Think there's no hope for your health? your health problems. Learn what our Minneapolis area patients already know! your health problems. Learn what our patients already know! Dr. Greg Fors Provides Functional Medicine For The Whole Family! First and foremost, we provide AFFORDABLE FUNCTIONAL MEDICINE and PAIN RELIEF solutions to Minneapolis area residents! It is real healing, naturally. Utilizing a functional medicine approach we treat complex and chronic conditions, from dad's back pain, mom's fibromyalgia and chronic fatigue to the kids' behavioral problems, anxiety, ADHD or Autism. Based on comprehensive laboratory and exam findings we work with your diet, nutrient levels, eliminating toxins, correcting digestion, removing food allergies to restore optimal function which can radically change your life or your child's life for the better! "Am I tired of being sick and tired? Am I ready for a change? Do I believe I can get better?" Stop piling one drug on top of another, escalating the real potential of dangerous drug reactions. Stop cutting out body parts. Give natural functional medicine and pain relief an opportunity to safely overcome the challenge of your chronic condition & anxiety. Are you ready to transform your life? We've done it for others, we can do it for you! We get to the cause and effectively treat it because we do not let insurance companies dictate what can and cannot be done for you. To make this very special care available to everyone, we offer payment plans to fit your budget. How much is your health or your child's well-being worth to you? Can you afford $35-$60 a week for Real Healing and to finally have the life you deserve? See the Minneapolis doctor who teaches other doctors, who wrote the bestselling book on fibromyalgia, neuropathy, chronic pain and fatigue, and the restoration of wellness "Why We Hurt". Dr. Greg Fors is a Board-certified chiropractic neurologist trained in the functional medicine treatment of chronic and complex disorders. The PAIN AND BRAIN HEALING CENTER, our name says it all! From chronic pain to brain health issues, we take the time to find out what's really wrong and how best to heal it, naturally! 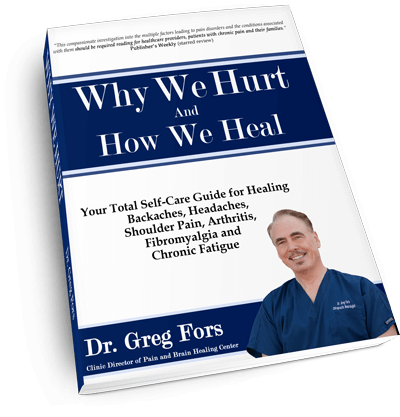 Join Minneapolis author Dr. Greg Fors as he reveals the healing solutions discovered in his own battle with disabling back pain and his daughter's severe fibromyalgia. Sorry, there are no events planned at this time.